At twentystone we’re going to spend a couple of months working through and trying to digest what Jim Belcher has to say about the church in his recent book, Deep Church. As I’ve read, I’ve found it very helpful. I’ve found the analysis of the current trends and discussions within evangelicalism thoughtful, and more significantly, I’ve been encouraged by the book’s gracious engagement of the diverse positions without being wishy-washy. For many, you may not have even known there was a conversation, let alone what it’s about and why it can devolve into a shouting match. Because you’ve not been aware of the conversation or because you may not understand what all the fuss is about does not mean that you shouldn’t engage with it. It is a special gift of a body of believers to be able to discern the spirit of the age. The spirit of the age refers to those particular things which mark the values, concerns, styles, etc… of the moment. In a religious context, the spirit of the age speaks to the peculiar cultural idols and commitments upon which a culture rests as more important than God — that is, the cultural idols and forces which compromise the expression and proclamation of true religion. When God rallied the men of Israel to David, he sent men from Issachar who had “an understanding of the times to know what Israel ought to do (1 Chronicles 12:32).” I agree with Sinclair Ferguson, that this particular gift is what is most needed by church leaders today — in an age when change happens so rapidly. You may be asking, “So what?” “What’s the big deal?” Or if it is a big deal, “Why does it matter that I spend time trying to understand it?” We study books like Deep Church because we will not grasp the wise course of direction nor respond wisely to the present situation unless we understand the times. A doctor must know his patient, and as is often true, the patient oftentimes doesn’t know he’s sick and if he is, he doesn’t want a doctor’s help…yet. How are we to contextualize the gospel unless we understand the context? How are we to stand against the spirit of the age unless we understand what that spirit is? How are we to help sick people unless we can help them learn to grow sick of their sickness? What is the difference between Modernity and Postmodernity? This is a hum-dinger of a question of which there is an ongoing debate. One group views Postmodernity as something different than Modernity while another group views Postmodernity as the reasonable consequence of Modernity. (Check out the chart noted below in the Resources for some of the differences). Though the definitions are contested, we have recognized a change; something is different. It is in seeking to answer the question, What is different? that we will learn the signs and spirit of the times. As you consider the Forward and Introduction, here are some questions to help you get oriented to the issues which we face in this age. How have things changed in the world since you were a child? What sorts of things did you assume were ‘matter of course’ or did not need explanation but were just true? How has that changed? How has technology changed the way we do anything and everything? What sorts of things do our children assume have always been true or can’t imagine being different? What do you believe to be “mere Christianity”? That is, what have all Christians always believed? What do you believe to be “mere church”? That is, what have and will all churches always do? If you’d like to explore more, here are some References and Resources for you. 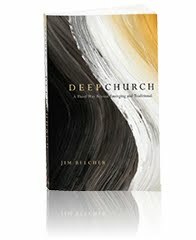 You can download from christianaudio.com, Jim Belcher’s Deep Church for $2.98 through Sunday, February 28. Resource page for Desiring God Ministries’ The Supremacy of God in a Post-Modern World. Al Hsu’s blog post on the meeting between John Piper and Tony Jones. A helpful chart on the differences between Modern and Postmodern. Pastor Tim Keller on Preaching the Gospel in a Postmodern City.